The purpose of this MoU is to provide SMEs from both the countries, a common platform, using which they can discover more trade opportunities, get assistance in online promotions and develop stronger relationships, which can help both the parties. This is certainly a big news for 8000+ Indian SMEs who are connected with CII, and are looking forward to expand their businesses across the globe. 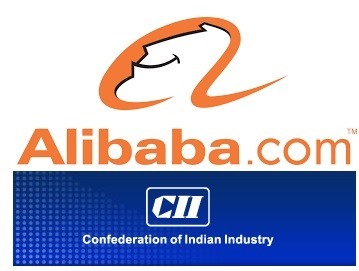 On the other hand, the MoU will help Alibaba to connect with Indian SMEs via 64 offices of CII spread all over the country, and to interact with 100,000 indirect members of CII, specializing in various trades. Indian SMEs have been receiving attention from the Government and Ecommerce portals lately, and this MoU is another positive step. In July last year, Government of India introduced one of its kind Ecommerce platform for SMEs; and introduced several exciting plans and proposals in the Union Budget to help them expand and grow. Flipkart has committed to bring 50,000 SMEs online, with a special MoU with FISME and NCDPD; and even Amazon is trying to lure SMEs into their platform with their new B2B venture. On the other hand, Alibaba has already made its intentions clear about their expansion plans in India, as they have invested $575 million in Paytm, a digital wallet & ecommerce platform, and rumors are rife about a possible partnership with Snapdeal. This recent MoU certainly signals something big.